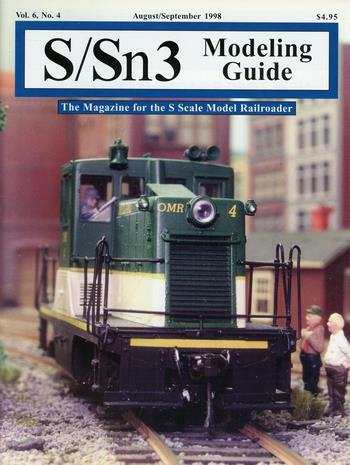 How can we encourage people into the hobby of model railroading, and, specifically, into S-scale? The author offers a few ideas. The author describes how he built his 11'x32' fictitious railroad in less than two years. Includes many photos, and a track plan. Photos taken of the contest winners at the 1998 NASG Convention. This locomotive was purposely derailed, placed on the street, and it drove under its own power to the center of town, so that its generator could be used to power a town struck by an ice storm. The author shares some of the tools he has made to help him with his modeling efforts. These include a figure holder, and solid base for preventing liquid-holding items from tipping over. This installment covers detailing a diesel engine's cab. The author reviews the wooden deck part that Building & Structure Co. produces for the replacement of the plastic deck of the S-Helper Service General Steel Casting flat car.